Dear Sir,—On the footing of that juvenile friendship and acquaintance with you with which I have been honored, and which was kept alive to our riper years, I now do myself the pleasure to address a line to you, to assure you of my respectful and affectionate remembrance of you, and of the satisfaction with which I sometimes call to mind those scenes of innocent amusement and play in which we were mutually engaged when we were boys. I have often thought of our attempts to imitate the man who flew from the steeple of the North Church, by sliding down an oar from the small buildings in your father’s house-yard at Wheeler’s Point; and by letting fly little wooden men from the garret window on strings. Have you forgotten that diversion? McClure was recalling how a traveling daredevil named John Childs had “flown” from Christ Church in the North End in September 1757, as discussed way back here. Childs actually slid face-first down a rope, which is why the boys at Wheeler’s Point tried “sliding down an oar” and “letting letting fly little wooden men from the garret window on strings” to replicate his feat. Our juvenile sports, and the joyful sensations they excited, are fresh in my mind; and what to me renders the remembrance particularly precious is, that I always flattered myself that our hearts and minds were similarly constructed. 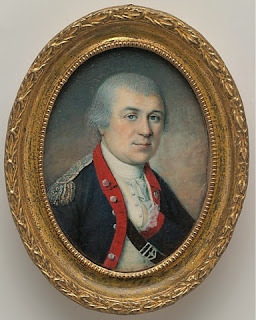 This is one of our few authentic glimpses of Henry Knox as a boy in the 1750s. Within a few years, Henry’s father suffered business reversals and left his family, dying in the Caribbean in 1762. Henry became indentured to a bookseller, his first career. On Monday, 7 November, I’ll speak to the Sudbury Companies of Militia & Minute about the events that allowed the launch of Henry Knox’s second career, as an artillery officer in the Continental Army. How did Gen. George Washington come to view his artillery regiment as in dire need of a shakeup? 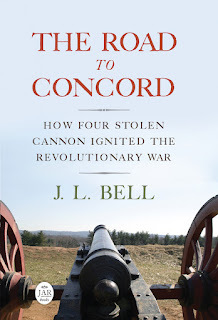 That talk will take place at the Wayside Inn in Sudbury at 8:00 or so, and I’ll have copies of The Road to Concord for signing.